OZAN KOSE/AFP/Getty ImagesChina’s persecution of its Uighur Muslim population in Xinjiang, western China, is gaining international focus. 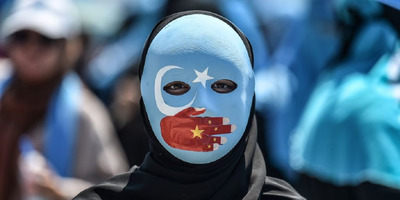 Here, a demonstrator in Istanbul wears a mask painted with the colours of the East Turkestan (or Xinjiang) and Chinese flags in 2009. Uighurs are placed under intense surveillance in their hometowns, with up to 1 million of them reportedly imprisoned in detention centres or re-education camps, where many are reportedly psychologically and mentally tortured. Kevin Frayer/Getty ImagesBeijing submits Uighurs under an unprecedented amount of surveillance. Here a police officer guards a street in Kashgar, Xinjiang. Lawmakers and international organisations are increasing pressure on China to stop these practices. But Beijing is not only ignoring their critics – it’s even trying to get them to follow their lead. The writer, Ai Jun, said Europe “may have overlooked its own troubles,” and singled out Britain, France, and Germany as countries with large Muslim populations and which were – according to Ai – vulnerable to terrorist and extremist threats. 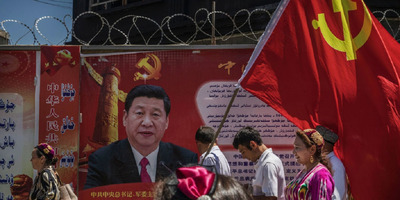 Kevin Frayer/Getty ImagesEthnic Uyghur members of the Communist Party of China carry a flag past a billboard of Chinese President Xi Jinping as they take part in an organised tour on June 30, 2017 in the old town of Kashgar, in the far western Xinjiang province, China. Kashgar has long been considered the cultural heart of Xinjiang for the province’s nearly 10 million Muslim Uyghurs. At an historic crossroads linking China to Asia, the Middle East, and Europe, the city has changed under Chinese rule with government development, unofficial Han Chinese settlement to the western province, and restrictions imposed by the Communist Party. 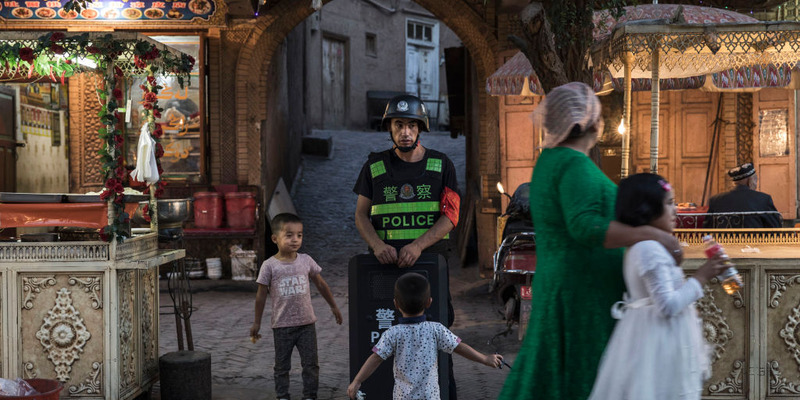 Beijing says it regards Kashgar’s development as an improvement to the local economy, but many Uyghurs consider it a threat that is eroding their language, traditions, and cultural identity. The friction has fuelled a separatist movement that has sometimes turned violent, triggering a crackdown on what China’s government considers ‘terrorist acts’ by religious extremists. Tension has increased with stepped up security in the city and the enforcement of measures including restrictions at mosques. China’s policy of attacking countries that criticised its own human rights issues is not new, and it doesn’t seem to be working, either. In fact, Western countries are ramping up their actions against China over the Uighur issue. This week alone, Reuters reported that 15 Western ambassadors in Beijing were seeking a meeting with Chen Quanguo – the Chinese official believed to have masterminded the Xinjiang crackdown – to demand an explanation over China’s Xinjiang crackdown.